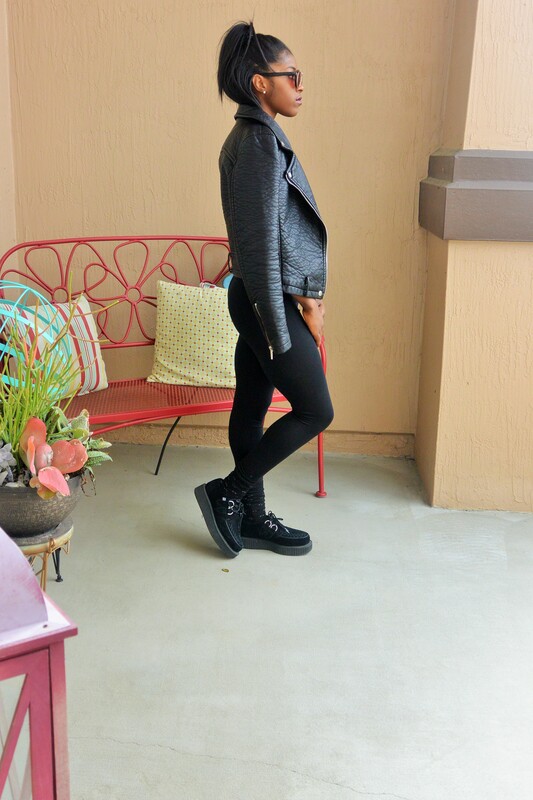 TOP | Forever 21 (similar here) – JACKET | Forever 21 (similar here) – LEGGINGS | Forever 21 – SUNNIES | Nasty Gal – SHOES | T.U.K. Happy Sunday everyone! This is going to be a short and sweet post as I am entirely mesmerized with watching the Academy Awards (specifically the red carpet), as I am always inspired by the gorgeous gowns that these celebrities strut in. Anyways, a lot of people have been asking me what is an appropriate way to wear a casual, mainly black, ensemble without looking too harsh and serious; therefore, I put together this super casual, everyday, outfit that can be worn on a day out around town. For this outfit I pulled together my favorite pieces for something that would be comfortable, yet remain stylish and in a simple color palette. When I wear all-black outfits I tend to tie in pops of color and, fortunately, I found this top from Forever 21 that had this beautiful, swirly pattern on the side in various shades of fuchsia. 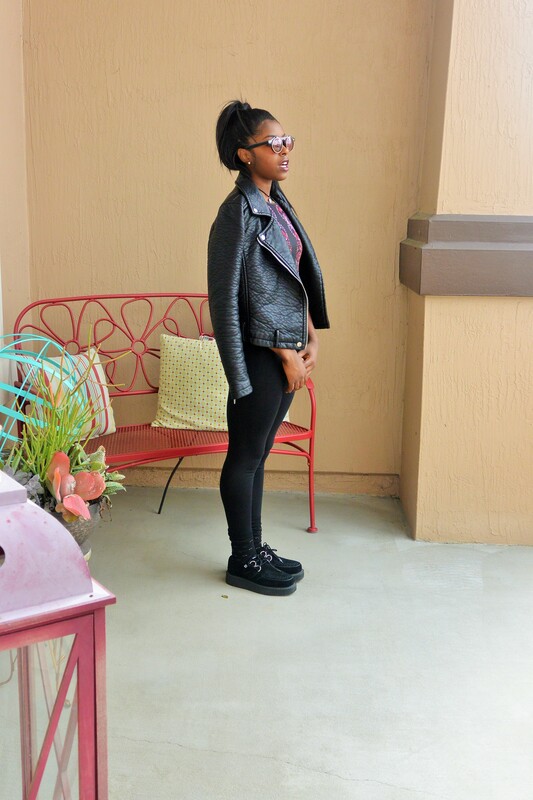 I paired this with basic black leggings, my creepers, and my treasured leather jacket. I accessorized with my sunnies from Nastygal that remind me of steampunk goggles 🙂 I also added some socks that had a subtle dotted print and this light locket choker. I feel as if this outfit epitomizes a casual day out for me and I will most definitely be posting more like it! I hope this helps in your stylish endeavors! Are there any other pieces or styles you would like my interpretation on?